KELY Support Group (KELY) cordially invites you to the Moody's RiseUp Photo Exhibition "The Eye of the I", where 35 local Chinese and non-Chinese speaking students use photography as a medium for self-expression when they view the world through the camera’s lens and translate their own unique perspectives into still images. Our programme Moody's RiseUp, funded by The Moody's Foundation, has been empowering student participants to voice their opinions with photography since 2015, and was quoted by Our Hong Kong Foundation’s research report as a programme that uses art to foster inclusion. 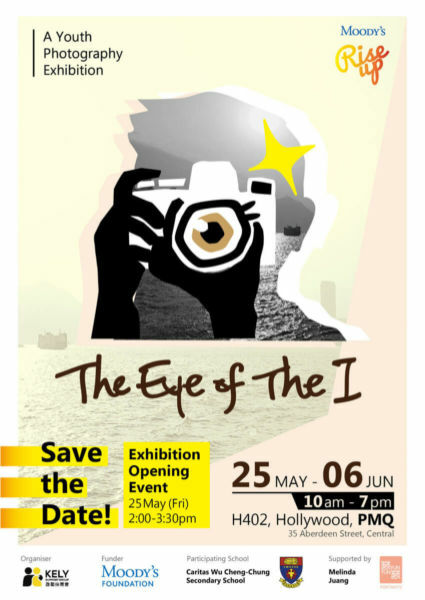 The exhibition runs from 25 May to 6 Jun (10am – 7pm) at PMQ. Exhibition opens at 2pm on 25 May.